In gale force south by south-east winds there was another excellent seawatch. The upchannel passage of Brent Goose gathered strength with 1165 counted along with 14 Shelducks, 24 Wigeon, Most other birds were moving west and included 21 Fulmars, three Sooty Shearwaters, 1163 Gannets, an Arctic Skua, an excellent 17 Great Skuas, 574 Kittiwakes,12 Little Gulls, a Sandwich Tern and 1104 Guillemots. Single Arctic and Great Skuas flew west whilst 300 Brent Goose flew east. A strong southerly wind was blowing and resulted in an excellent seawatch with three hours of observing producing 408 Brent Goose east, 122 Wigeon, four Teal, 15 Pintail, and two Great Northern Divers, ten Sooty Shearwaters, four Great Skuas, 223 Kittiwakes, 47 Mediterranean Gulls and a Sandwich Tern passing west. Two first-winter Caspian Gulls were seen again. A flock of 14 Siskin flew out to sea. Singles of Velvet Scoter and Great Skua flew west and the regular first-winter Caspian Gull was still present. A Sooty Shearwater passing west was the highlight of the day. Seawatching produced six Pintail and a Great Skua passing west. The first-winter Caspian Gull was still present along with an adult Yellow-legged Gull. Another very windy and frequently wet day restricted observations to sea and gull watching. 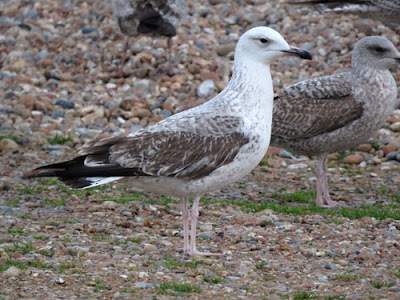 Two Caspian Gulls were seen with a new second-winter bird and the regular first-winter bird still present. Offshore there was a steady passage of Gannets and Kittiwakes, a few Fulmars and two Great Skuas west but Brent Geese continue to think it is spring with another 210 birds in small flocks moving east during the day. An adult and the regular first-winter Caspian Gull were seen around the Point again. Three first-winter Caspian Gulls and a Yellow-legged Gull were seen around the Point and a few Razorbills and Guillemots were passing westwards offshore. Another two new Caspian Gulls were the highlights of the day with a second-winter bird at the Patch in the morning and a first-winter bird dropping in briefly at the offerings of bread at the fishing boats in the late afternoon. The long-staying first-winter bird was also seen at both the Point and the Patch during the day where an adult Yellow-legged Gull was also present. Three Chiffchaffs were seen around the northern Long Pit and six Siskins flew over. Todays new bird (above) and the regular bird (below). Limited coverage today but a two-hour seawatch in the morning produced just three Gadwall and a Little Gull of note. Seawatching continues to provide most of the interest with 14 Shelducks, a Goosander (a surprisingly scarce bird offshore), nine Red-breasted Mergansers, a Black-necked Grebe, a Great Skua, 45 Kittiwakes and a few auks passing west of interest. However, there was almost a spring feel to the day with 140 Brent Geese passing upchannel. A new second-winter Caspian Gull was seen in the roost in the morning. Seawatching this morning produced a Pomarine Skua and a Sandwich Tern. The afternoon gull watching session revealed three Caspian Gulls on the beach, although only one was a new individual, and an adult Yellow-legged Gull. With a brief spell of calm weather this morning a check of the bushes was in order and produced at least eight Firecrests and six Chiffchaffs in the trapping area and around the Long Pits. Seawatching was pretty uneventful but in the afternoon the third-winter Caspian Gull (PNXB) was seen again and coming to the offerings of bread. A 2.25hr seawatch this morning produced 640 Gannets but not much else other than a drake Eider and a few auks. Yesterdays first-winter Caspian Gull was seen again in the gull roost this afternoon. Another stormy day with seawatching and gulling the only reasonable options. Nearly six hours of watching produced five Red-breasted Mergansers, four Fulmars, a Sooty Shearwater, a Snipe, two Great Skuas and singles of Little and Mediterranean Gulls of note and numbers provided by 344 Great Crested Grebes, 1010 Gannets, 53 Kittiwakes and 192 auks (mostly Guillemots). An adult and a first-winter Caspian Gull and three Yellow-legged Gulls were feeding and roosting at the Point. A Leach's Petrel passing slowly west was the obvious highlight of an otherwise fairly quiet four hour seawatch this morning. Another colour-ringed third-winter Caspian Gull was seen in the gull roost. Over 500 Gannets flew west during 3.5hrs of watching but very little else was passing on another very windy day. A first-winter Yellow-legged Gull came to bread at the Point. A Sandwich Tern was feeding offshore and there was a westerly trickle of Gannets and Kittiwakes during the morning. A Firecrest was seen in the trapping area and a few finches continue to pass overhead. A second-winter Caspian Gull and two adult Yellow-legged Gulls were feeding at the Patch this morning. Nearly four hours of seawatching produced two Black-throated Divers, 730 Gannets and 100 Kittiwakes. Two Firecrests and a Chiffchaff were seen at the Long Pits and 530 Starlings arrived. Most of the interest today was at the Patch where a new colour-ringed adult Caspian Gull (PKKK) was seen along with a first-winter Little Gull and a third-winter Yellow-legged Gull amongst hordes of commoner gulls. A party of seven Red-breasted Mergansers and two late Sandwich Terns also flew west at the fishing boats. Four Firecrests and two Chiffchaffs were seen in the trapping area and a Brambling and 18 Siskins flew over whilst 900 Starlings arrived. A Lapland Bunting made a brief appearance on the beach at the fishing boats and a Woodcock and four Firecrests were seen at the Long Pits. Finches continue to move through with 130 Goldfinches, 12 Siskins and a Redpoll of note. A couple of other pieces of interest. For those of you who generously contributed to the Acadian Flycatcher bucket fund the trustees decided to use this to purchase a digital microscope. 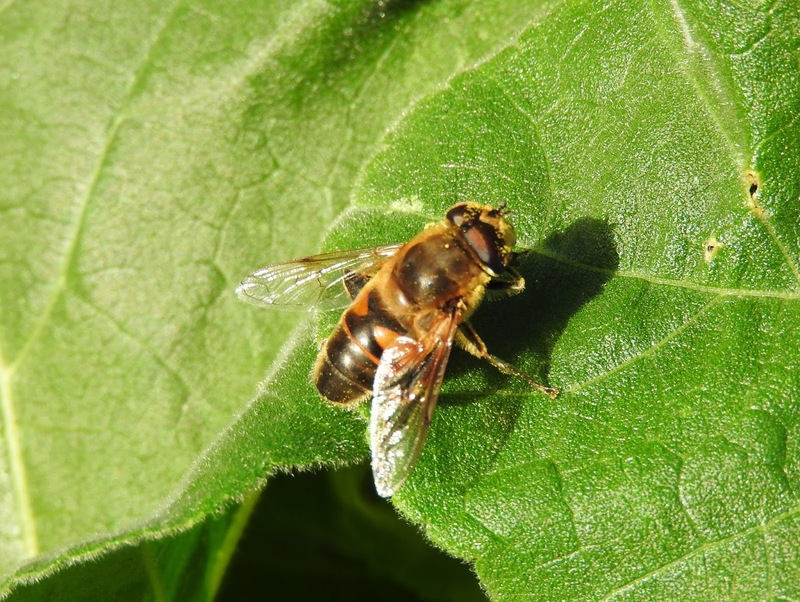 This will help with our ongoing and wide-ranging recording of the wildlife of the Dungeness peninsula. Many thanks. 1st A day spoilt in the main by thick fog. A short clear spell in mid-morning revealed a fewGoldcrests, five Firecrests, five Blackcaps, six Black Redstarts and a Wheatear on the ground and a Grey Wagtail, two Rock Pipits and a few Goldfinches, Siskins andRedpolls passing overhead. The Dusky Warbler was still present though remains pretty elusive.There was little movement offshore although a juvenile Pomarine Skua and a Little Gull were seen in the afternoon and a new first-winter Caspian Gull came into the offerings at the fishing boats. 2nd The day began and ended with more thick fog and as usual in these conditions there was little evidence of any migration although a Dartford Warbler was seen in the Desert and five Firecrests were scattered around the Point. 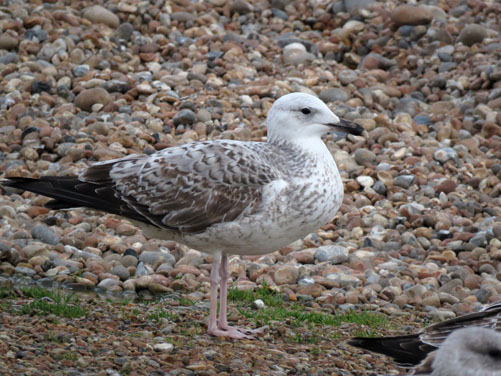 There was no movement offshore but the Polish-ringed Caspian Gull first seen a few days ago made a reappearance. Polish-colour-ringed bird Red with White code 65P5. 3rd The day was dominated by a decent movement of finches during the morning but there was very little in the way of grounded migrants with just four Woodcocks, 30Goldcrests and five Firecrests of interest. Birds passing overhead included sevenBramblings, 1000 Goldfinches, 45 Siskins, 150 Redpolls and a Crossbill.There was no virtually no movement offshore but at least two Mediterranean Gullswere feeding there. 4th After overnight and early morning rain there was a decent scatter of grounded migrants with the highlights being a Long-eared Owl in the trapping area and a Woodlark in the Desert. Numbers were provided by 75 Goldcrests, eight Firecrests, 12 Song Thrushes and 16 Redwings.Overhead passage involved 41 Skylarks, 500 Goldfinches, 60 Siskins and 70Redpolls. The sea was very quiet again but the Polish-ringed Caspian Gull 65P5 was seen again at the Point. 5th Not a great deal to be seen today. Good numbers of Goldfinches and 70 Redpollspassed through and four late Swallows were also seen.The sea was very quiet through the morning but improved a bit in the afternoon and ending with day totals of 232 Gannets, eight Mediterranean Gulls, 359 Kittiwakes, seven Sandwich Terns and a few auks passing westwards. A Woodcock also arrived. 6th A mostly wet and windy day with most of the interest offshore although two (an adult and a second-winter) briefly staying Caspian Gulls at the Point were the best on offer.The trapping area produced a Brambling and a flyover Rock Pipit and 4.5 hrs of seawatching resulted in a Sooty Shearwater, 1252 Gannets, an Arctic Skua, 1048Kittiwakes, a Little Gull, four Sandwich Terns and a very late Common Tern being seen. 7th Most of the interest remains offshore and at the Point with at least five first-winter Caspian Gulls being the highlight. Passage included 475 Gannets, a Pomarine Skua, two Arctic Skuas and 521 auks. Very quiet on the land with just 500 Goldfinches of note. 8th A dull and windy day with a good movement of seabirds offshore, finches and a Wood Lark overhead and plenty of gull activity at the Point with four Caspian Gulls and including a new Polish-ringed bird. Two Caspian Gulls Larus cachinnans first-winters Dungeness 8th November 2015. Seawatching produced two Sooty Shearwaters, 325 Gannets, 25 Knot, a Pomarine Skua, 550 Kittiwakes, 28 Mediterranean Gulls, a Little Gull, two Sandwich Ternsand a few auks. Two Yellow-legged Gulls were also present. Birds passing overhead included 270 Starlings, 68 Chaffinches, two Bramblings, 1350 Goldfinches, 150 Linnets and 21 Redpolls. Four Chiffchaffs were seen in the trapping area. 9th Not a great deal to report today in very windy conditions except for the continuing passage of Caspian Gulls with a new green-ringed (XMFV and probably of eastern German or Polish origin) bird joining the throng at the Point where Caspian Gull Red 65P5 was still present along with two Yellow-legged Gulls. A few Gannets and twoSandwich Terns flew west.A Firecrest was seen in the trapping area and two Fieldfares and a few finches passed through. 10th A miserable day of strong winds and murky, damp conditions. The only bird of note was a Pale-bellied Brent Goose which flew west at 0750hrs. 11th A fairly quiet day with three Firecrests in the trapping area and a Marsh Harrier going out to sea of note. Three Sandwich Terns were feeding offshore whilst a few other birds passing overhead included 53 Chaffinches, 11 Bramblings, 400 Goldfinches, 27 Siskins and 32 Redpolls. 12th A decent overhead passage this morning with numbers dominated by 1600 Wood Pigeons and 2675 Starlings and good numbers of finches including 55 Chaffinches, ten Bramblings and 43 Siskins and also a Wood Lark, four late Swallows and 11Tree Sparrows of note.Grounded migrants were much less in evidence but did include six Firecrests in the trapping area and 11 Chiffchaffs across the whole area. Two first-winter Caspian Gulls (including Polish Red 65P5) came to bread this afternoon and four Mediterranean Gulls, 67 Kittiwakes and 135 auks flew west. 13th Very little to be seen on a cold, windy and at times wet day. A Woodcock at the northern end of the Long Pits, a Short-eared Owl on the beach near the fishing boats and another late Swallow were about the best on offer..
14th A walk around the Long Pits before the weather really deteriorated produced aKingfisher, three Firecrests and six Chiffchaffs whilst 500 Wood Pigeons and nineBramblings flying overhead were of note.Seawatching was fairly slow-going but eventually produce seven Red-breasted Mergansers, a Sooty Shearwater and nine Mediterranean Gulls of interest. Two adult Caspian Gulls were of note in the roost this morning. 15th A very windy day with few birds to be seen. The only birds of interest were two first-winter Caspian Gulls (including Polish 65P5again) amongst the gulls roosting/feeding at the fishing boats. A couple of Firecrests were heard un the trapping area. 16th Another windy day with little to be seen. The only birds of note were a third-winterCaspian Gull amongst the gulls roosting on the beach and a Great Northern Diverand a Pomarine Skua which flew west offshore in the afternoon.Also of note, a Dusky Warbler was seen at Hookers Pit on the RSPB Reserve in the afternoon. 17th Three Sooty Shearwaters west offshore during the morning were the only birds of note on an increasingly windy day.The Dusky Warbler was seen at Hookers Pit on the RSPB Reserve again this morning but was very elusive. 18th In increasingly windy conditions most of the observations were of birds offshore which included a Velvet Scoter, one Black-throated and two Great Northern Divers and three Great Skuas. 19th Another dull, damp and windy day restricted most of the observations to the sea where nearly four hours of watching produced two Black-throated and two Great Northern Divers, a Sooty Shearwater, four Great Skuas, 298 Kittiwakes, three Mediterranean Gulls and 27 Little Gulls. 20th The first relatively calm day for a while allowed a decent check of the land whilst there was a steady trickle of birds passing west offshore.The highlight of the day was a single Little Auk which flew west at 1100hrs but other notable bits and pieces offshore included 24 Red-breasted Mergansers, a Great Skua, 94 Kittiwakes, 35 Mediterranean Gulls and 11 Little Gulls. Of note on the land were 11 Firecrests and six Chiffchaffs along with a small increase in thrushes including three Fieldfares and eight Song Thrushes and a few finches passing overhead including a single Brambling and 110 Goldfinches. The Dusky Warbler was seen at Hookers Pit on the RSPB Reserve again this morning but remains very difficult to see. 21st The first really cold day of the autumn and a NNW wind which rapidly increased to gale-force by mid-day resulted in good numbers of birds passing offshore but made coverage on the land almost impossible.Of note on the sea were 55 Teal, four Pintails, four Tufted Ducks, 169 Common Scoters, a Velvet Scoter, two Goldeneyes, four Red-breasted Mergansers, 1428Gannets, a Pomarine Skua, 246 Kittiwakes, 50 Little Gulls (three flocks), 29Mediterranean Gulls and 1160 auks. A Little Egret, a Snipe and 3850 Starlings also arrived from the east. The Polish first-winter Caspian Gull (65P5) made another appearance in the afternoon. 22nd A cold and bright but calmer morning produced a mixed bag of birds offshore and a decent little arrival of birds on the land.Birds seemed to be moving in all directions offshore and included 393 Brent Geese, 91Shelducks, 210 Wigeon, eight Pintails, an Eider, 126 Common Scoters, a Velvet Scoter, a Goldeneye, four Black-throated Divers and a Great Northern Diver. On the land the most significant birds were 65 Blackbirds along with two Fieldfaresand four Song Thrushes whilst a Merlin, 1800 Starlings, three Bramblings, 20Goldfinches, 15 Siskins and three Redpolls passed through. Two Firecrests were seen in the trapping area and a Black Redstart was seen around the power station. 23rd A very cold, frosty morning but much quieter offshore and on the land than yesterday.The best of the seawatching were five Gadwalls, two Eiders, four Red-breasted Mergansers, 46 Red-throated Divers and 100 Kittiwakes. 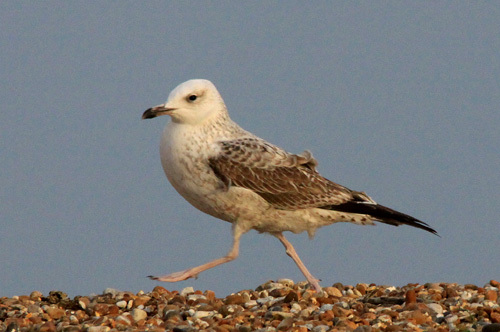 A new first-winter Caspian Gull was seen on the beach for a few minutes before heading off to the west. Very quiet on the land with just a few Blackbirds in the bushes and 2500 Starlingsarriving. 24th A day of almost continuous rain and poor visibility.The only serious observations were offshore where three hours of observations produced 26 Fulmars, singles of Great and Pomarine Skuas and five Little Gulls all passing west of note. 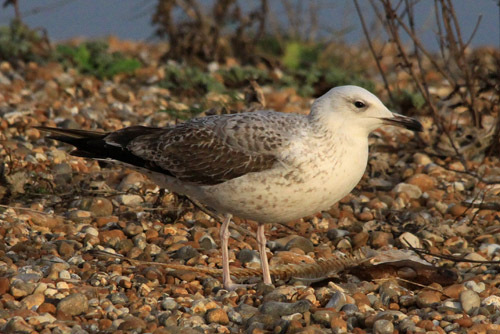 The Polish Caspian Gull 65P5 was on the beach again. 25th Very little movement offshore but a juvenile Pomarine Skua, two Little Gulls and aMediterranean Gull were seen at the Patch in the morning and in the afternoon an adult Caspian Gull was found in the roost at the Point. A few finches including eight Siskins and two Redpolls flew over and two Firecrestswere seen at the Long Pits. 26th Very little movement offshore but with eight Eider, two Black-throated Divers and three Mediterranean Gulls passing west of note and three Little Gulls at the Patch.Finches continue to trickle through with a Brambling, ten Siskins and sevenRedpolls of interest whilst a Green Sandpiper flying over was an unusual record. Over 1500 Starlings also arrived. Four Firecrests were seen in the trapping area and two Black Redstarts were feeding along the power station wall. 27th A very quiet day with just two Black-throated Divers and a Purple Sandpiper passing west during the morning, two Little Gulls at the Patch and two (first-winter and second-winter) Caspian Gulls in the roost at the Point. 28th Limited coverage today but a first-winter Caspian Gull was seen at the fishing boats. .
29th Very little to be seen on a very windy and unpleasant day. 30th The wind continues and even increased during the day. The only observations were again at the Point where a Great Northern Diver flew west and the roosting gulls included an adult and a new third-winter Caspian Gull and a third-winter and an adultYellow-legged Gull.